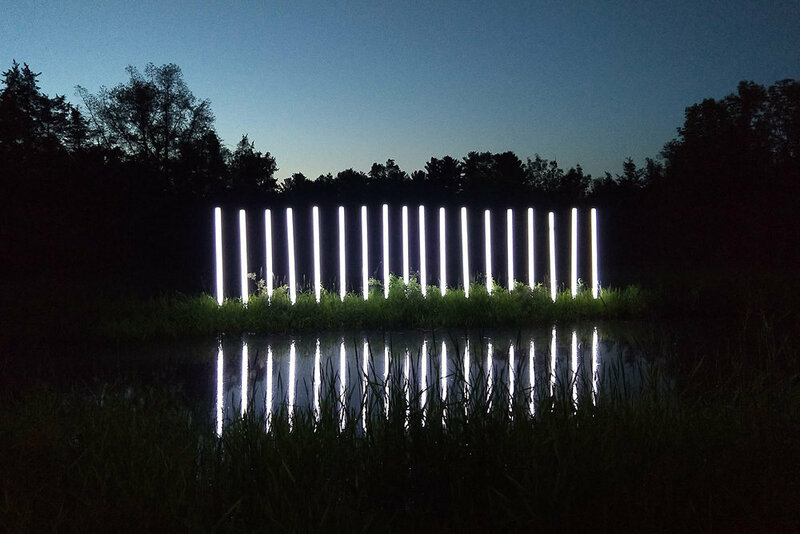 Lightstream 108 is an outdoor light sculpture sited along the edge of a seasonal marsh on the Residency 108 property. With this piece, I wanted to create a work that responded to the place physically through the interplay of light and the landscape. I also see it as a monument to and celebration of my experience at 108 and of my interaction with the land over the course of the residency. The installation consists of 18 eight-foot metal light poles covered in white fabric and planted in the ground. Placed along the edge of the marsh, the poles reflect in the water. Their height varies with the height of the ground at each point, incorporating the site into the piece in a small way and breaking the strict regularity of the straight lines. The installation is animated by texts, with the characters in each text translated into their binary representations, strings of ones and zeros, and then streamed across the light poles. Each ‘one’ is represented by an illuminated pole and each ‘zero’ by a darkened one. The light program begins at sunset and runs for several hours. On the first night of the installation, it streamed the mantra “Om mani padme hum” one hundred and eight times as a dedication to the property. Thereafter, it streamed a short prose poem about the marsh where it was located. The fixed position of the poles, their size and spacing creates a sculptural experience, but at night, the pattern of words across the light posts creates something more like a performance, with the choreography of the lights driven by the embedded pattern of the text. I cut a clearing in the forest where the hills roll like waves frozen in time. At first, there is nothing. Then green all at once. A blaze of green. In the low spot, the waters collect, the young trees lose their trunks and the orange gash of the blackbird’s wing sounds the air above the marsh grasses. I am an interloper, an animal, a piece of this place, indivisible.